Houston’s best live music and cultural festival is back for it’s 38th year. 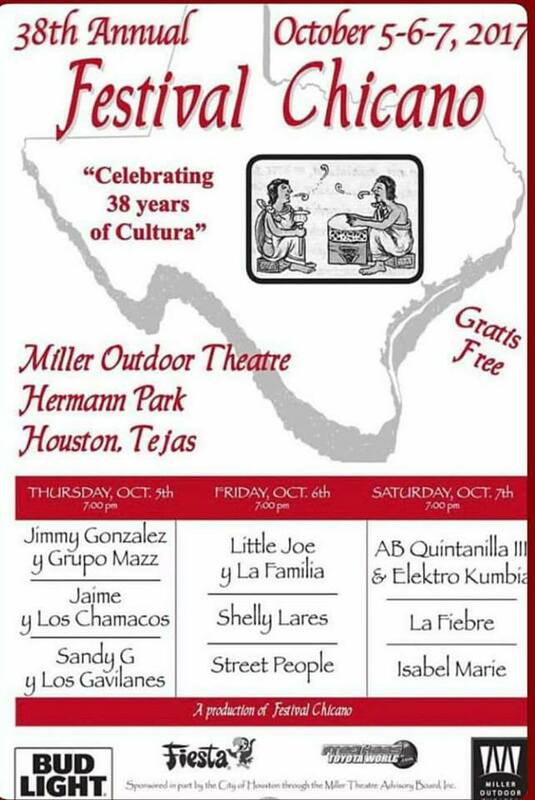 Festival Chicano will be held October 5-6-7, 2017 at Miller Outdoor Theatre. Here’s your chance to listen to the best music en La Onda Chicana, including Mazz, Jaime y Los Chamacos, Little Joe y La Familia, Shelly Lares, Street People, AB Quintanilla, La Fiebre, Sandy G Y Los Gavilanes, and Isabel Marie. Come join 5,000 or so of your closest friends each night. Congrats and a big Gracias to Daniel Bustamante, the event founder and organizer for keeping nuestra cultura alive and at the forefront of the local music scene.